It is interesting to speculate as to why British director John Madden (“Shakespeare in Love”,” Marigold Hotel” etc) would choose the totally different and sometimes impenetrable world of the American political jungle as the setting for his latest film. Part of the answer is probably the title character’s climactic courtroom speech about the American political landscape, which is the stuff that cheers are made of and is also part of a very neat final twist to the plot. The particular area under scrutiny here is the dirty tricks world of the American lobbyists. Nobbling senate votes in dodgy ways seems to sum it up. It is a world which is quite challenging and difficult to understand for a British audience. But it is the natural environment for top lobbyist Elizabeth Sloane (Jessica Chastain). The film opens with Elizabeth facing unspecified charges in a court room. We then go into the main body of the film, the events leading up to that opening scene and getting straight into the meat of the situation, which is a proposal, by our standards a very mild one, to amend and strengthen the virtually non existent American gun laws and something to which a UK audience will be sympathetic. The feminisation strategy proposed by the lobbyists opposing the bill is amusingly outrageous – a suggestion that they start promoting guns as tools of female empowerment. Elizabeth is briefed to lobby against the amendment but she chooses to change sides and join its supporters, led by Rodolfo Schmidt (Mark Strong). Chastain is perfectly cast in both looks and persona as this powerful, driven woman, who has an empty centre. The killer spiky stiletto shoes she wears throughout as she clacks along the corridors of power are an effective symbol which enforces the character. Strong’s role as a man, who starts to wonder what sort of monster he has hired, is disappointingly thin. 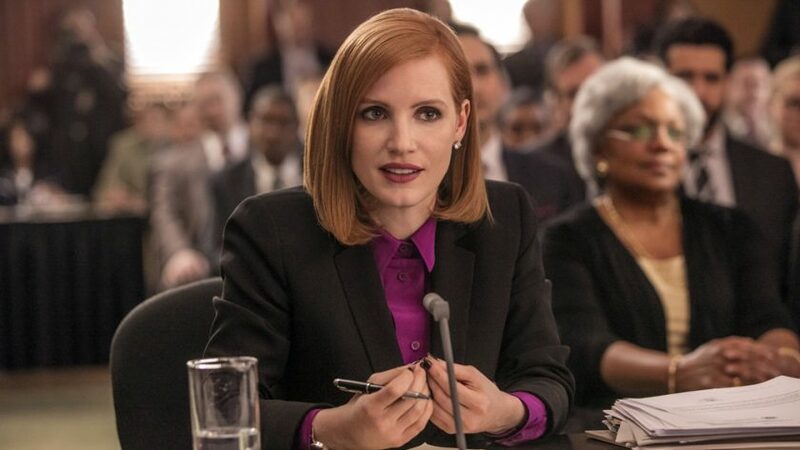 He doesn’t have a lot to do apart from comment from the sidelines but there’s also a strong contribution from Gugu Mbatha-Raw as Elizabeth’s main ally, who then becomes her victim in Miss Sloane’s ruthless obsession to win at all costs. The film sometimes gets bogged down in difficult to follow detail but when it takes fire, as in a cracking sequence involving a television debate or that last courtroom speech, it is ace drama.